A wonderful feature about magazines is their format. They don't tend to have long items of text. Instead you find short stories, short articles, text boxes with bullet points, illustrations with captions - lots of snippets and textual treats. For a child who is beginning to read independently, but not sold on the whole reading thing, a chapter book can be off-putting. The format of magazines may be much more attractive. It's important for kids to be exposed to different types of reading material. While magazines are a staple reading diet for many adults, we sometimes forget magazine subscriptions when we're thinking about reading gifts for kids. In magazines, they can find articles that further their knowledge and interest in all sorts of topics, from pets to paragliding, from folk-tales to fish. They'll find different text types too - narratives, recounts, recipes - all of it aimed at their interests. Magazines are an excellent vehicle for teaching kids elements of visual literacy. They're a great source of maps, text boxes, tables, illustrations, graphs, pie charts, labels, captions, cartoons, and diagrams. Discussing how we get information from these elements, and what they tell us, is a really useful activity to do with kids. Check out the magazine section in your local library. Are there any suitable for kids? Don't discount adult magazines. A youngster who loves to ride his bike will enjoy looking at the pictures in BMX Today, and you can read him the captions and excerpts from articles. Look for magazines in your child's interest area online, and consider a subscription. Getting a magazine delivered personally to his own letter box is such a special treat for a child! 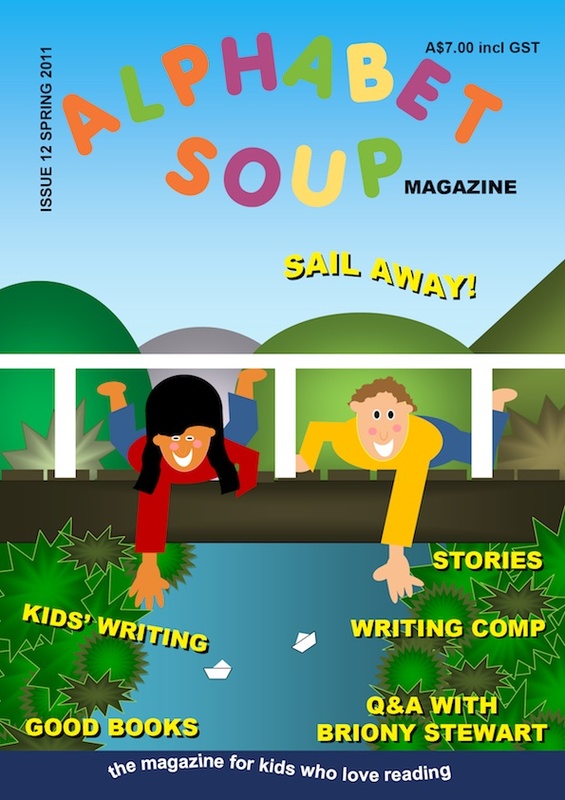 Alphabet Soup: This is a full colour print magazine for kids who love to read and write. Inside you'll find stories by Australian authors, poems, articles and interviews, writing tips for kids (from The Book Chook), and children's own writing and art work. I think it makes a great resource for schools - editor, Rebecca Newman, says class mini sets of the magazine (10 copies per season) have proved very popular. Visit the magazine's website to find out more about individual and school subscriptions. In conjunction with today's post, Rebecca has a special offer for The Book Chook readers, both Australian and International. Get 5 issues for the price of 4 when you buy a 1-year subscription, or 10 issues for the price of 8 with a 2-year subscription. This offer lasts until 31 October 2011. (Offer does not apply to 'mini set' subscriptions.) Simply type bookchook in the special offer box (under the country options) when placing your order online via Alphabet Soup's website. Ranger Rick: It's published in Canada, so this magazine is themed that way. Ranger Rick is a great print magazine for young lovers of wildlife. Check out the website for some activities and articles. Jeanne of A Peaceful Day said, "We adore Anorak." Here's an interview with Anorak's mum and dad. Andi Sibley from A Wrung Sponge said, "My boys like the National Geographic Kids and Ranger Rick magazines." The National Geographic Kids website is a great resource. Susan Whelan from Reading Upside Down said, "My kids have always enjoyed the CSIRO Scientriffic magazine - interesting articles, experiments to try, stories, puzzles etc. Aimed at 7 - 12 I think. There is one called Helix for kids 10+ as well." Zoe from Playing by the Book had a great series about magazines recently called Reading Outside the Book. I like the sound of BIG Kids magazine, described recently by Melissa at Imagination Soup. BIG stands for Bravery, Imagination, Generosity. The magazine is set to be published in September. I also love the look of Okido, a UK Arts and Science magazine aimed at under 7s. You can see some recent pages at the website where you can play games and listen to songs too. Read Zoe's feedback on it. Highlights Magazine - I described the website, but don't know the print mag personally. It's a well-respected US children's magazine. Rebecca Newman (editor of Alphabet Soup magazine, see above) recommends The School Magazine. She says her kids love it, and it's full of good stuff including comics, a cartoon, jokes, articles, stories and poems. You can get a taste of it at the website.